This species inhabits rocky reefs and occurs off Massachusetts and Bermuda through the Caribbean to Brazil. It is also reported in the Eastern Atlantic around the Ascension and St. Helena islands. Due to its broad geographic range spawning times may vary. In the Gulf of Mexico, off Florida, spawning has been reported from January through June. Rock hinds are hermaphroditic, beginning their life as a male and later transforming to a female. 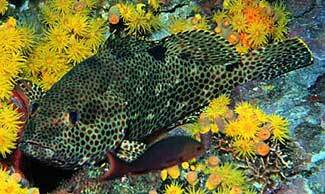 Spawning aggregations occur offshore along rocky reefs but early juveniles are found in near shore waters. This species matures by their third year and reaches a maximum age of twelve years.Low frequency sounds are produced by vibrating the axial muscle against the swim bladder. These sounds have been documented when handling or harassing these fish but it is likely that sound production is also used in association with courtship and spawning.